All parents try to do their best - but the best of intentions don't always produce the best results. Dr. Jane Nelsen, an experienced psychologist, educator, and mother, believes that children misbehave when they feel thwarted in their need to belong and in their need for love and attention. An authoritative approach, using phrases like "Because I said so! ", will only lead to rebellious behavior. Instead, parents need basic principles that bring them and their children closer. They need Positive Discipline. Dr. Nelsen explains that parents who use kindness and firmness to teach life skills will encourage self-respect, self-discipline, cooperation, good behavior, and problem-solving skills in their children. 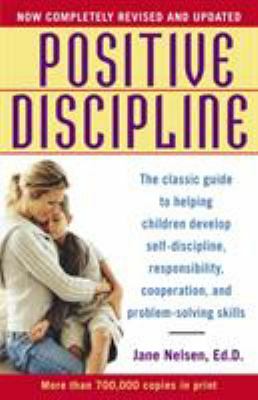 In Positive Discipline, revised and updated for the '90s, she shows all of us, parents and teachers alike, exactly how her practical program works - answering, step-by-step, such important questions as: What works better than punishment to teach children positive, good behavior? What mistakes do most parents make "in the name of love"? How can parents turn their mistakes into assets? How can praise be dangerous? What are the dangers of trying to be "Super Mom"? How can teachers avoid discipline problems in the classroom?